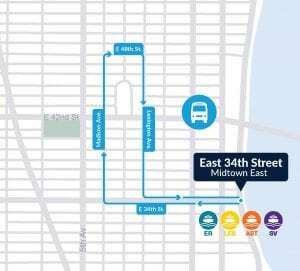 The current East River route of NYC Ferry by Hornblower connects growing residential and business communities along the East River to communities in Midtown and the Financial District. Weekday Schedule for east river ferry route. LIRR Train – 49-13 Vernon Blvd. 7 Train between 50th Avenue and Vernon Blvd.